There are currently 15 Major Leaguers still hitting over .400 and while that means things have been great for fantasy owners, it also means bad times are coming! The last batting champ to hit .400 was Ted Williams in 1941. Nomar Garciaparra and Ichiro Suzuki own the highest batting averages since 1990 when they hit .372 in 2000 and 2004 respectively. Bonifacio is a career .267 hitter and will come back down to earth, quickly. The Chicago Cubs might be able to ride him out but your fantasy team can ill afford it! Be smarter than the rest of your league and offer him in a trade while he is hot. 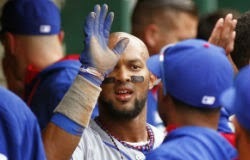 You will never be able to trade Emilio Bonifacio during a cold streak. If your league recognizes that he is untradeable, as soon as you see a back to back 0fers, drop him for someone else. Blackmon is a career .303 hitter over 491 ABs in 4 stints and a career .309 minor league across 6 seasons. Playing in Colorado and a career .300 hitter, you can hold onto Blackmon with confidence. Kubel returns to the Minnesota Twins where he is a .273 career hitter and is capable of 20 doubles and 20 home runs. Hold onto him. Pagan is a career .284 hitter and a quality fanta7sy player, if he can stay healthy. If someone wants Pagan, work out a deal, if not he is a quality player to own. Utley is a career .288 hitter and one of the greatest 2B hitters...from '04-'08. Chase has just 28 ABs this season and hasn't played in the Phillies last two contests. If you can deal him, deal him. At 35, health is a major concern. Perez could be one of the top catchers in baseball if he can stay healthy. He is a career .305 hitter and at the catcher position you'll have a hard time finding better. Hamilton is injured so no need to worry about him for the time being. Be realistic with Flowers. A career .205 hitter means he might not be getting a hit the rest of the season! If some White Sox fan is in your league, see if he/she will take him! Solarte will continue to play everyday with Mark Teixeira out and Kelly Johnson playing first base. He won't hit .429 but could hit between .260 and .270. Keep him in your rotation for off days until Major League pitching adjusts. Rendon is a .277 career MLB hitter and there is no reason to believe he can do much better than that with a .270 minor league average. 2B is weak and Rendon has always been considered a top prospect. Ride it out and if someone offers you a deal you like, take it. Cuddyer hasn't played 140 games since 2010 but he is way to good to not want for however many games he plays. He is a career .278 hitter but as a member of the Colorado Rockies has hit .306. 30 doubles and 20 home runs are hard to find these days, keep him on your roster. Alexei Ramirez has always struggled in April, but this season is off to a fast start. The White Sox SS is a career. 280 hitter which is very respectable for a SS these days. He no longer hits the long ball, but is a decent option at a weak position. If you need to add him to a deal to make it sweeter, there are ways to replace him. Tulo is the creme de la creme of SS and when healthy, proves it.. The only way you rid yourself of Tulowitzki is if he is on the DL. Aramis Ramirez is a career .286 hitter (.298 with the Brewers). He is a huge injury risk and if you have a solid backup then you can hold onto Ramirez until he lands on the DL, because he has great RBI potential. If you are offered a deal for Ramirez and it works for you, pull the trigger. Click here to have all new blog posts sent to your inbox!